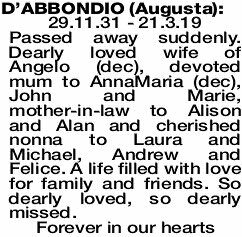 D'ABBONDIO AUGUSTA 29.11.31 - 21.3.19 Passed away suddenly. 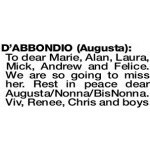 Dearly loved wife of Angelo (dec), devoted mum to AnnaMaria (dec), John and Marie, mother-in-law to Alison and Alan and cherished nonna to Laura and Michael, Andrew and Felice. A life filled with love for family and friends. So dearly loved, so dearly missed. 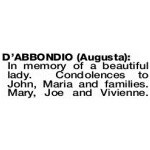 Our deepest sympathy to Marie, John and families in the sad passing of your mother. RIP Augusta. 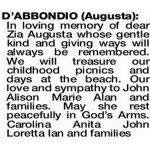 D'ABBONDIO AUGUSTA Treasured memories of our dear, beautiful Zia Augusta. Always in our hearts. Deepest sympathy to Marie, Alan, John, Alison and families. In memory of a beautiful lady. 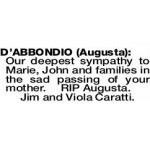 Condolences to John, Maria and families. Mary, Joe and Vivienne. 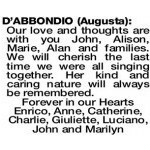 D'ABBONDIO AUGUSTA Fond memories of family times shared in Lovero and Perth over our lifetime. 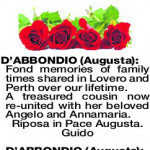 A treasured cousin now re-united with her beloved Angelo and Annamaria. A respected cousin and lovely lady with a gentle soul who we will deeply miss. Ciao Augusta. Heartfelt sympathy to John, Marie and all loved ones at this sad time. Marisa, Sesto, Giulia, Claudio, Steven, Daniela, Robert and families. A special place in my heart of a caring and gentle Godmother, who lived her faith daily, showing compassion, selflessness and love to all. Now in Paradiso with all her loved ones. Sincere sympathy, love and prayers to John, Alison, Marie, Alan and families. Debra, Gary, Christian, Amanda and James. 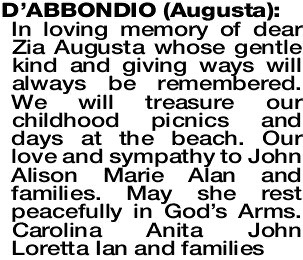 In loving memory of our dear Zia Augusta. We will forever cherish her sincerity, warmth and generosity to us all. Treasured family times shared together will never be forgotten. Heartfelt sympathy to John, Marie, Alison, Alan and families. Rest in peace in God's care. 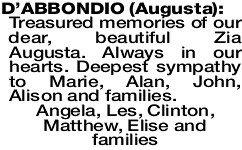 Augusto, Vittorio, Gilda, Rosanna, John and families. To dear Marie, Alan, Laura, Mick, Andrew and Felice. We are so going to miss her. 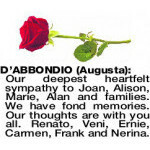 Rest in peace dear Augusta/Nonna/BisNonna. 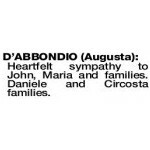 D'ABBONDIO AUGUSTA Heartfelt sympathy to John, Maria and families. Daniele and Circosta families. Our deepest sympathy to Alan and Maria. 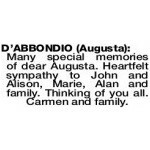 Many special memories of dear Augusta. 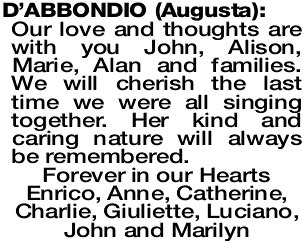 Heartfelt sympathy to John and Alison, Marie, Alan and family. Thinking of you all. Our love and thoughts are with you John, Alison, Marie, Alan and families. We will cherish the last time we were all singing together. Her kind and caring nature will always be remembered. To Marie, Alan, Laura, Mick, Andrew, Felice, John and Alison. So many shared memories. 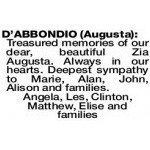 Augusta you will be sadly missed. Danny, Rosa, Jamie, Bec and Wanda. 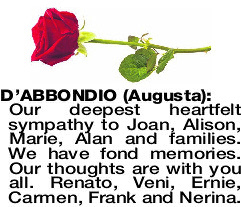 Our deepest heartfelt sympathy to Joan, Alison, Marie, Alan and families. We have fond memories. Our thoughts are with you all. Renato, Veni, Ernie, Carmen, Frank and Nerina.